We are living in interesting times. And by interesting, I mean, terrifying. Millions of us are living with the constant fear of deportation. Millions more live in fear for their safety because of the color of their skin, the origin of their faith, the object of their affection, or their gender identity. There are those of us who are desperately trying to protect our ancestors’ sacred grounds. And millions more who are trying to protect our cherished Mother Earth from the damage we have already done and yet may do without stronger safeguards. Some of us are trying to protect our reproductive rights. Others are trying to save our children’s right to a quality education and affordable health care. Millions more are trying to protect our basic rights as human beings. Our human rights. No doubt, we are living in terrifying times. But we are also living in interesting ones. We have recently witnessed the largest single-day demonstration in U.S. history. 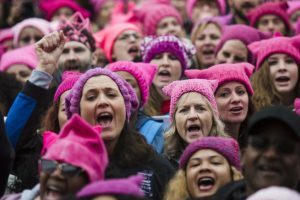 The Women’s March drew at least 500,000 in Washington D.C. Worldwide participation is estimated at 5 million women and men, with over 400 marches held in the U.S. and more than 150 more in 81 countries around the world. WASHINGTON, DC- JAN 21- Groups gather for the Women’s March on Washington on Jan. 21, 2017. What I love about the Women’s March, aside from its unprecedented size and peaceful nature, was that it invited us to play with our power. To make a game of it even. To connect with each other using our creativity, sense of humor and generosity. The hand-made signs were brilliant! Thousands of knitters donated their time, talent and yarn to knit hats for marchers in D.C. There is another global virtual march scheduled this month. I am still knitting pink hats for all of my daughter’s friends. We’ve found that post-march, wearing them around town is a great way to strike up a conversation, meet new allies and reinforce our commitment to political activism. All of which make the times we’re living in a little less scary. Playing in public, playfully, we are not just exposing our playful selves, we are demonstrating the contrast between the fun that we are sharing and the estrangement we would normally be sharing: strangers among strangers, separate, concerned for the most part with only our selves, only our needs; doing our best to ignore each other, to ignore the boredom, dullness, loneliness, silence, fear, alienation. I have written before about how play can be a powerful path to peace. But can play be a form of political activism? To play is to imagine; to imagine is political because it allows us to envision a different order, a different system, a different way to separate economic resources and power. But playful protesting is not just the domain of radical feminist knitters. Musicians, in fact, have long been in the protest business. From John Lennon’s legendary, “Imagine,” to concert fundraisers like Live Aid and Farm Aid to the more recent Unite to Face Addiction rally on the National Mall. 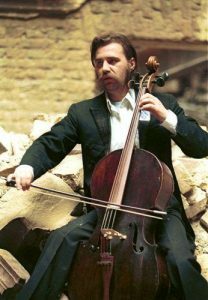 Perhaps one of the most moving musical protests in my lifetime was orchestrated by one man, Vedran Smajlović, who was the principal cellist for the Sarajevo Opera. At risk to his life, Smajlović regularly played amidst the rubble of his war-torn country to bear witness to the countless lives lost in this bloody civil war. And then there are the other artists—the performing artists, the visual artists, the poets and the pen-is-mightier-than-the-sword artists. From Picasso to Adrienne Rich to Banksy, artists in every era have given creative voice to many a protest movement. Have I convinced you yet that embracing your playfulness can help you reclaim your power? Not to mention your sense of humor and maybe even a little hopefulness for the future? Pick Your Powers—No superhero worth his or her kryptonite has an easy challenge. In fact, s/he is usually faced with figuring out how to stop impending global destruction (sound eerily relevant?). Luckily, most superheroes have some nifty super powers like the ability to generate protective force fields, shape shift or fly. Take a few moments to identify your biggest challenge right now (political or otherwise). What special powers could help you defeat the bad guys and save the day? Spend some time imagining them. Perhaps draw or journal about them. Then entertain the possibility that you may already possess these abilities, even if only metaphorically. You are likely to discover you have inner resources and allies you may have overlooked. That’s okay. We superheroes often forget who we really are. Create Your Own Epic Rally—What do you want to march for? Where would you march? Who would you invite to speak? What celebrities do you want to champion your cause? What special clothing or gear would you like to represent your movement? Who will interview you for the nightly news? Imagine the world is waiting for your invitation and the details so they can join you in record numbers. We’ll give extra credit for anyone who organizes a real rally! Choose Your Battle Cry—You’ve got your super powers, you’ve got your rally, now you just need to come up with your protest poster(s). Combine your passion with a little political wit and you’ll increase your chances of being heard and remembered. You’ll also relieve some tension. Need a little inspiration? 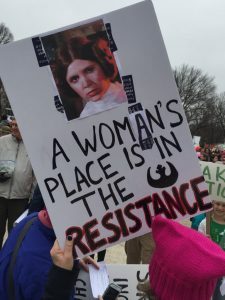 Here are some favorites from the Women’s March and a little British humor for you Anglophiles. If not, email us to learn how we can help you liberate more joy as you take committed action. 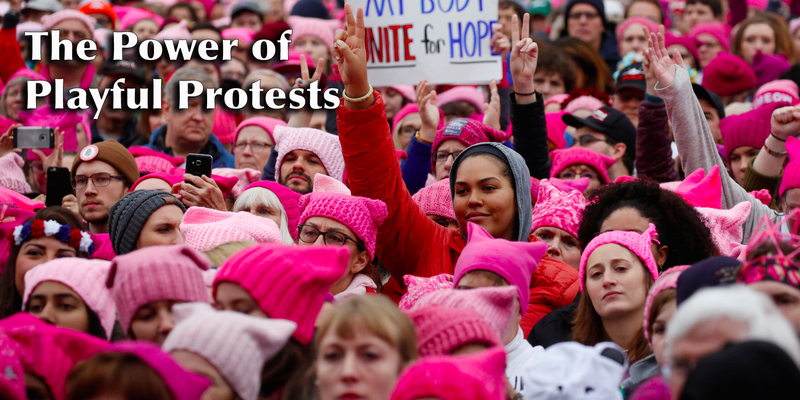 Photo credits: Header Photo, Reuters – Shannon Stapleton; Women’s March, Washington Post – Amanda Voisard; Vedran Smajlović, Wikimedia Commons – Evstafiev Mikhail; A Woman’s Place…, Twitter.